Customers are moving through their own buying process to help them be confident they are making the right purchasing decision. Yet too many salespeople rush through their steps of selling, leaving the customer far behind. To sell more effectively, salespeople have to learn how to match their speed of selling to the speed of buying. If your salespeople can spend more time with each prospect than your competitors do, they will build a stronger relationship with the customer. In Slow Down, Sell Faster! ®, you’ll learn how to help your customers through each step of their buying process faster, and with the odds shifted in your favor. Get more appointments—especially at the C-level—by using a problem-focused approach. Combat your most lethal competitor, the customer’s decision to do nothing. Use probing questions to diagnose small problems that can point to bigger needs. Master the complicated politics of complex sales. Overcome common selling dilemmas, such as customers who go silent at the eleventh hour, and more. You already know how to sell. 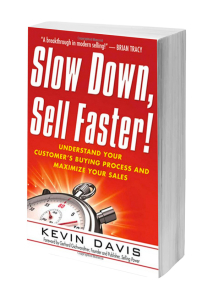 It’s time to learn how people buy—to slow down so you can sell faster!